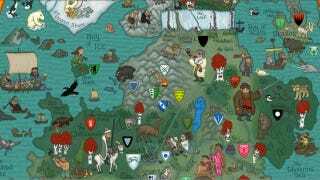 Check out this amazing illustrated map of the seven kingdoms of Westeros — riddled with crests, beasts and heaps and heaps of amazing spoilers. It's simply gorgeous. This illustrated wonder was created by the artist called Other-In-Law (who has a bunch of close ups of the map at that link). This thing is just stuffed with goodies. It's like a Where's Waldo for GOT. Ten points if you can find Jaime Lannister. (Click on the map to enlarge the image). And if you really want to get into the GOT mood, play this fantastic violin cover of the show's introduction while you scan the banks of Westeros.